Founded in 2013 by brothers Simon and Goran Grbac, the family brewery quickly rose to recognition, mostly due to the quality of the beer, based on natural spring water from St. Ivan’s spring. Besides unfiltered, unpasteurized light, red and dark beer, the Buje brewery also brews indian pale ale and american pale ale beer. Soon, the small hill above Buje saw the construction of a country-style hotel and a fully fledged brewery – Beer House San Servolo, which is now also known as a steak-house, serving delicious cuisine from the grill that you can wash down with their signature beer. The entire property has a very pleasant atmosphere, perfect for incentive groups and together with a guided tour of their production and beer tasting, a very special venue for events as well. One of the facilities that make up the unique experience in San Servolo is a beer spa, the first beer spa in entire Istria. The spa offers beer baths, saunas, a fitness area and an indoor pool, looking out to the idyllic Istrian landscape. Beer aficionados and everyone, who appreciates a glass of quality beer can get a chance to see the San Servolo beer being made, and more importantly, try all of the different flavours from the Croatian brew masters. There’s a lot to be learned about their top-notch unpasteurized beer, which is truly full of flavour. The region of Istria itself can pride itself on exceptional cuisine and the San Servolo resort is no exception. The chefs at San Servolo especially emphasize steaks and dished that go well with their beer. The restaurant is also suitable for larger groups, as there is room for around 200 guests. The resort has 14 excellently furnished rooms with very nice views. Half of them are styled in a more traditional way and the other half in a completely modern, so it’s all up to the guests to decide. The first Istrian beer tourism center certainly won’t let you down. 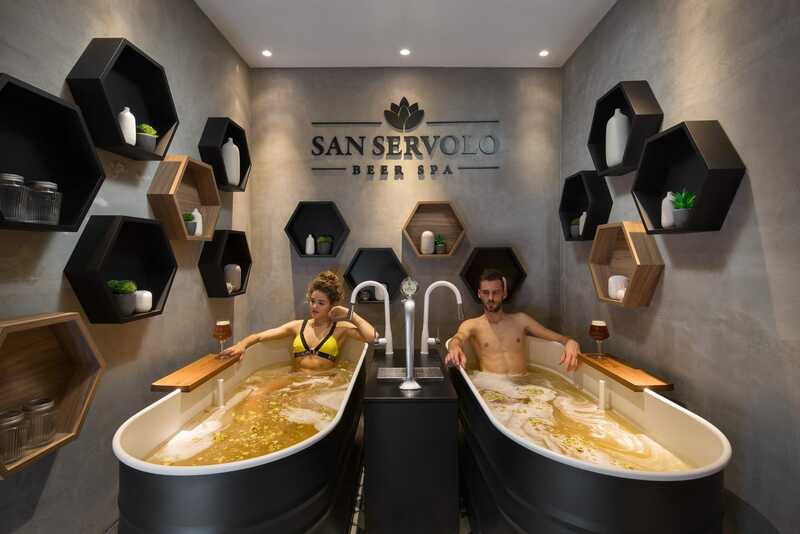 Beer Resort & spa Hotel San Servolo is a paradise for all beer lovers and one of the nicest experiences of authentic craft brewing in the region.